If you’ve been following along, I started this blog in March of 2012. I never expected to make this much progress but it’s great to start seeing results. I also didn’t expect to encounter a great community of like-minded investors to bounce ideas off. It’s also very motivating to me to see other people invest and reach their goals. Well, with my latest purchases that I’ll mention next week with my weekly purchases article, I’ve reached a forward dividend income of $12,000. That means I’ll be receiving $1,000 on average each month over the next 12 months without any further capital being invested. This is certainly not enough to retire off of but it’s a great mental milestone to hit the $1k mark per month. The beauty of dividend growth investing is seeing compound interest work its magic. It’s sort of like a snowball rolling down a hill. 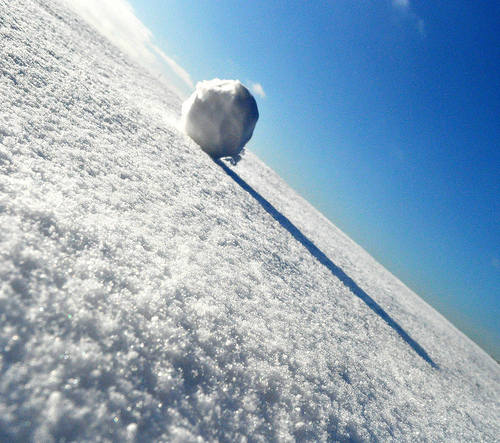 You may start with a tiny ball of snow but the longer that the snowball rolls (time) , the faster it rolls. It’s not just moving at a constant speed, it’s accelerating! The more snow it accumulates (dividend increases or new capital added) , the faster the acceleration. This acceleration means you should hit $200/month just a little faster than $100/month and so on if you are keeping contributions the same. Pretty soon you’ve got a snowball that will produce $100/month, $250/month, $500/month (posted June 2013), $600/month in dividends (posted Aug. 2013) and now $1000/month! Next stop , $1500/month (hopefully by late next year or early 2016). The hill is very high but I am picking up speed. I can just start making out what looks like FI at the bottom! I hope to see you there some day! Very impressive! Soon the snowball will be producing $1500/month in dividends. Keep up the outstanding work. Thanks for the support. I’m sure I’ll see you at FI some day. Indeed, compound interest is great when it’s working for you instead of against you. Thanks alot! I won’t hit all of my goals this year but I think I still did pretty good. I’ll see you at the bottom! Congrats! What an awesome milestone!! Your snowball is definitely accelerating. You’ve been putting capital to work at a rather prodigious rate. Very, very impressive. Life is good. I hope to reach this milestone myself within a few years. I certainly can’t complain. I was hoping to be a little ahead of where I am but I did set some very aggressive goals. Thanks alot! You are making some nice pace yourself down the hill. I’ll see you at the bottom! Awesome milestone to hit. This is my next goal. I’m still a way off from it but I have my sights on the $1k/month income. My first immediate goal was to reach the $100 a month mark which was surpassed a while back. Thanks fr sharing and for inspiring. Thanks! That first $100 is huge; each $100 more after that should just come faster and faster. That’s the beauty of compound interest! You are making great progress yourself, I’m sure you will be at $1k/month before you know it! Congrats! Great achievement! Now it will be rolling faster and faster. Reinvesting $1000 a month plus your contributions is a great deal! Thanks a lot. I’m fortunate to have so many fellow investors following along. Indeed, the snowball is gaining speed and $1000 will go a long ways. Wow that’s about the same amount I contribute per month. Great work. One day I hope to be there, my next goal is that $250 /month mile stone. Keep it up ! Thanks buddy. You are making some nice progress yourself. Good luck in reaching your $250/month goal. Wow! $1000 a month is an enormous goal to reach. Join the club, I reached the same milestone a few months back. Looks like we’re both aiming for $1,500! Excellent job! That $1000 will go far in reinvesting each month. Can’t wait until I approach a level similar to yours! Keep up the great work! Thanks! Yes, that extra $1000/month will make a big difference each month. I should be able to keep contributing more and more with my increasing dividends. Consistency is key; I’m sure you’ll be there soon enough. Congrats. You’re on your way to the financial freedom and security we are all looking for. And you’ll be there before you know it. Once again, Congrats. Congrats on the remarkable achievement. Your success is an inspiration to me and other dividend investors. While I am only at $100/month in dividend income, I can’t wait until I am writing this same article in the future. Keep up the great work! Best of luck reaching your next milestone soon. With the steam your snowball is gaining, you will get there in no time! Thank you! I’m happy that I can inspire a few others to keep investing. I know I’ve made more progress that I thought was possible and it just reinforces why I chose the DG path to FI. $100/month is a great milestone, each $100 after will be much easier to hit. Congrats and I know with the continued yearly increases in growth rates on each stock’s dividend rate you will reach your goals faster than ever. I am closing in on $5000 per year, though I may take a while to reach $12,000 a year, it is fun watching my dividend income raises increasing faster than my own employment raises…lol. Thanks! That’s right and that’s why I’m sticking to dividend growth companies. You’re right, the raises I’ve been getting from the companies I own are much higher than a typical job raise of maybe 3% if you’re lucky. It’s exciting to see these raises each year and it just compounds the income even faster! What a milestone to hit! Awesome news for sure and I wish you the best on hitting that 1500 soon. I look forward to following along and seeing you crush all your goals. Indeed, I have been waiting to post this one for a while! Thanks, $1500 might take another year for me. I appreciate you following along on my journey and wish you continued success. Congrats on reaching the $1K a month milestone! You’ve been moving at a great pace. Best wishes for continued success. I’m not a huge fan of winter, but I love snowballs! AAI, congrats on the milestone! Its been great following your journey and watching your success. Upward and onward! Thanks a ton! Your blog was one of the first I saw and inspired me with your consistent purchases. I loved the weekly increases to your future dividend stream. Now I’ve got my stream of growing dividends working for me. I wish you continued success as well. I’d be almost entirely retired. One man’s milestone is another man’s finishing point? Haha, everyone has their own financial situations I guess. While I could cut out a lot of expenses, It would be difficult for two people to live off of $1000/month. Everyone has a different end goal and completely different starting points which make a huge difference. I think the main thing is to find the right balance of happiness/frugality. I’m sure you’ll find yours soon enough! Congratulations – that is a serious milestone, but equally its one that you’ll laugh at in 10 years time when you are generating $5k a month in dividends. Onwards and upwards (or should that be downwards in the snowball running down the hill analogy?)! Indeed, what a beautiful beast she is! Thanks a lot! I agree, the compounding after another 10 years will be tremendous. I’m actually hoping to generate $5k in dividends in just 5 more years. That’s a heft goal but I’m shooting for it! Haha. Yes, down that hill as fast as I can roll! $1000 a Month? That’s awesome!